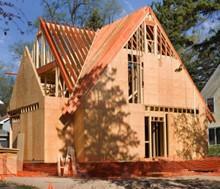 Get an online estimate for your construction project. Construction websites with online estimates can take a lot of the guesswork and uncertainty out of your home improvement project. Are you thinking of adding a great room, extra bedroom, or sun room to your home, or perhaps updating your kitchen or bathroom? If you're like most homeowners, you only have a vague idea of what your project might cost. And, you're hesitant to involve a contractor if the cost might just not be in your budget at this time. Construction web sites with online estimates are a great answer to this dilemma. A variety of Web sites offer construction quotes for remodeling projects. Some are geared toward consumers, other toward contractors, but all will give you an idea of the basic cost. Some sites, particularly those designed toward new home construction, such as Resi-Cost, charge a fee for the service, but most are free. In addition, many local contractors with Web sites offer an online form that you can send to the company for a written estimate - much easier than going to their office or having someone come to your home. Projects may vary from a new addition to smaller projects, such as new gutters or a waterproofing system. Lowe's Project Calculator - Find out how much wood, carpet, paint, or insulation you need for your project. Today's Homeowner Home Improvement Calculator - Get an estimate on what and how much of a particular material you'll need for your home improvement project. Accurate Estimates.com - A division of Lowe's home improvement stores, this site offers a variety of services to help you plan your project or addition. Personal interview - Although an online estimate is a good way to budget your home improvement project, it is still wise to choose a contractor based on a face-to-face interview. How else can you gauge whether you'll be able to work with that person? Ask for references - and call them - Any reputable contractor will be happy to supply you with names and contact information of satisfied past customers. Use this information and call the contacts. Ask them about the contractor's business practices and if they are satisfied with their remodeling project. Remember: you're the one that has to live with the result, not the contractor. Check with the local BBB - Give your local Better Business Bureau a call to check your potential contractor's record with them. Although the vast majority of contractors are honest and trustworthy, there are a few shady operators out there. Don't pay the balance until you're satisfied - This sounds simple, but paying before the project is finished to your satisfaction is a good way to ensure that it takes longer than you'd like for the project to be done. However you decide to hire a contractor, finding construction sites with online estimates is a great first step toward creating that addition or upgrade of which you've always dreamed.